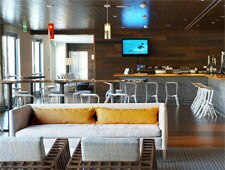 Creative yet familiar contemporary cuisine awaits at HB's hip Shorebreak Hotel. : Located inside Shorebreak Hotel, Zimzala soothes the soul with a Zen-like atmosphere and retro-chic style --- it’s a refreshing contrast to the party vibe in the popular Main Street neighborhood a couple blocks over. The menu's contemporary coastal cuisine feels familiar yet is tweaked just enough to give dishes a fun, lively quality. Starters range from soft pretzels paired with a beer-infused cheese to chicken wings in Korean bulgogi sauce served with kimchi peanut crumble. More substantial openers include a classic margherita flatbread or an apple salad with arugula, bacon and medjool dates. The compact list of mains includes Moroccan chicken with golden couscous and a grilled hanger steak with smashed Yukon potatoes and chimichurri. Cap off your meal with a classic crème brûlée. A solid array of international wines and local beers is available. Breakfast features healthy options alongside indulgent offerings such as chilaquiles and thick banana french toast.